Gal Gadot has credited Vin Diesel for helping her break into the film industry. The 32-year-actress has revealed the 49-year-old actor gave her her "first chance in the film world" after casting her as Gisele Yashar in the fourth installment of the 'The Fast and The Furious' franchise in 2009, which is an opportunity the brunette beauty will "always" be grateful for. 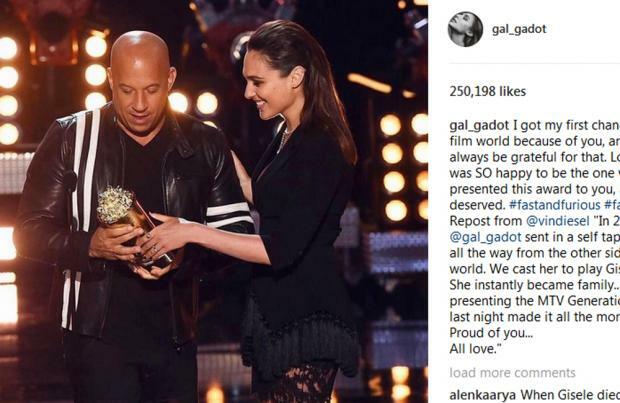 The 'Wonder Woman' star - who portrays Diana Prince in the upcoming DC Comic production - shared a picture of her presenting the 'California-born star with the MTV Generation Award for the motor-racing movies at this year's MTV Movie and TV Awards on her Instagram account. She captioned the sweet post: "I got my first chance in the film world because of you, and I will always be grateful for that. Love you! I was SO happy to be the one who presented this award to you, as it is well deserved. #fastandfurious #family (sic)." This post comes after the California-born hard man - who plays Dominic Torreto in the action film alongside Dwayne Johnson, Jason Statham, Michelle Rodriguez and the late Paul Walker - praised Gal as "family" and thanked her for making the award ceremony on Sunday (07.05.17) evening even "more special" for him by giving him the accolade.